Antonio Tauler (Illes Balears) s.t. Olaf Pollack (T-Mobile) @ 2sec. Sergio Escobar (Illes Balears) s.t. Prologue map. 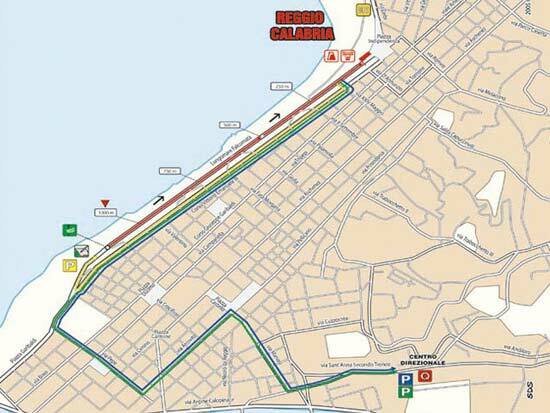 Just a straight 1.15 km (in red). 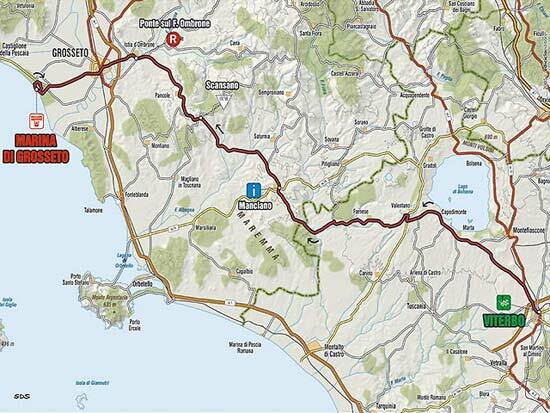 Stage 1, Sunday, May 8: Reggio Calabria-Tropea, 208 km. 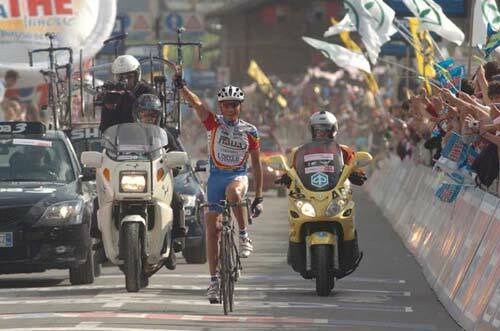 Paolo Bettini scoots away on the climb to the finish to get his first Giro stage and his first Pink Jersey. Mauricio Alberto Ardila (Davitamon-Lotto) s.t. Danilo Di Luca (Liquigass) s.t. Stage 1 route map, missing a piece off the toe, but you can see how the riders will circle around back north up the east side. 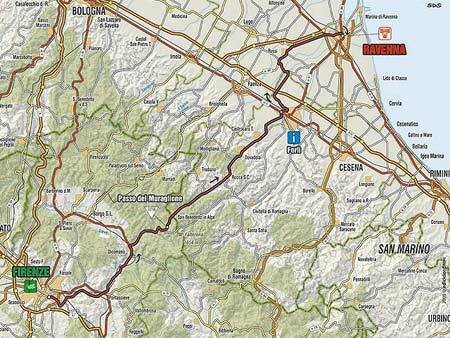 Stage 2, Monday, May 9: Catanzaro Lido - Santa Maria del Cedro, 182 km. 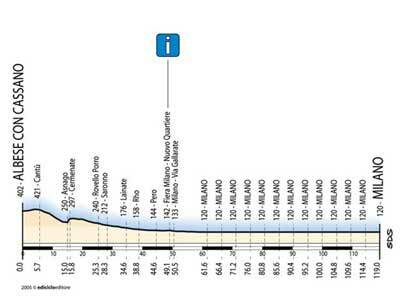 Giro Stage 2 sprint. McEwen gets a close one. Picture credit, Fotoreporter Sirotti. Isaac Galvez-Lopez (Illes Balears) s.t. 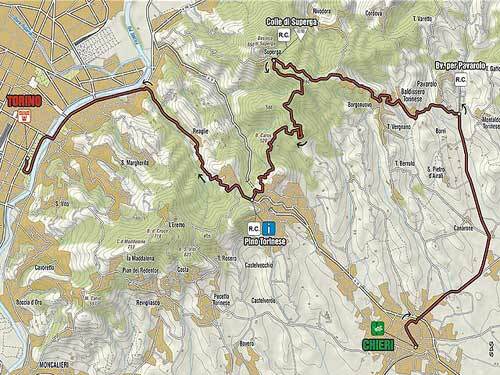 Stage 3, Tuesday, May 10: Diamante - Giffoni Valle Piana, 205 km. Km 195.2, Santa Tecla, 365 meters. 3rd category climb. And they say baseball is a game of inches! Di Luca gets the precious 20-second time bonus by barely taking Stage 3 from Cunego. Fotoreporter Sirotti picture. Danilo Di Luca (Liquigas) 5hr 24min 17sec. 37.929 km/hr. 20sec time bonus. Stefano Garzelli (Liquigas) s.t. 8sec time bonus. Cristian Moreni (Quick Step) s.t. Serhiy Honchar (Domina Vacanze) s.t. Two riders quit today, Christophe Detilloux (FDJ) and Tom Steels (Davitamon-Lotto). I believe both are sick. The finish. 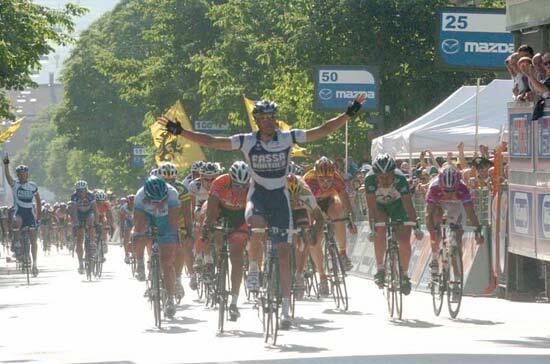 Liquigas had the numbers and gave their man, Danilo Di Luca the leadout he needed. 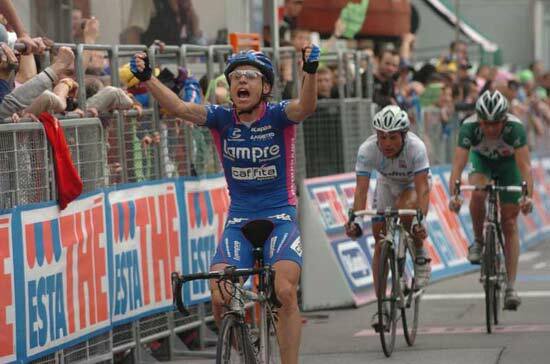 Damiano Cunego challenged him, but Di Luca took it. 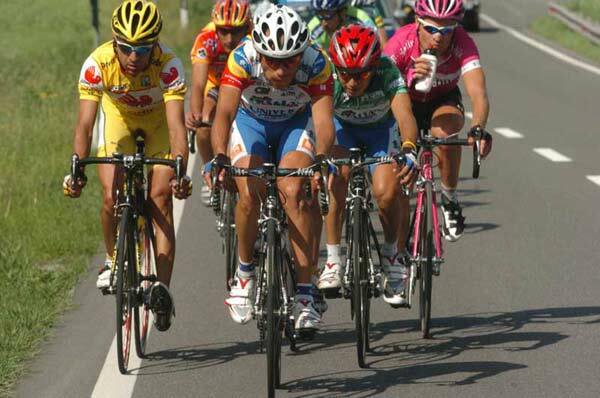 Paolo Bettini was in the front group, so he shoud re-take the Pink Jersey. 8 km to go. Over the top, Liquigas is in charge for the moment. 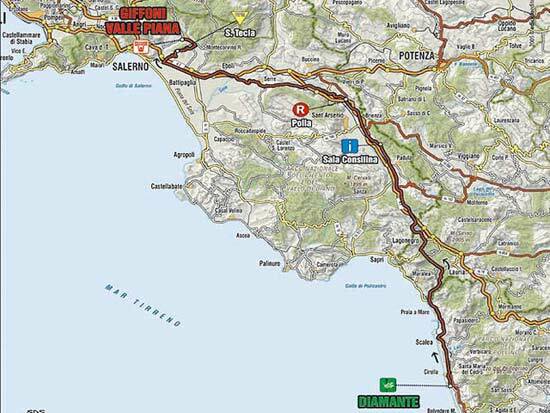 They took the first three places of the GPM (the Giro's Mountain competition): Dario Cioni, Stefano Garzelli and Di Luca . Danilo Di Luca is feeling frisky and is hammering the lead group. Petacchi and the other sprinters went over the top at least a minute behind. About 30 went over together, but now the lead group has grown to 50. 15 km to go. 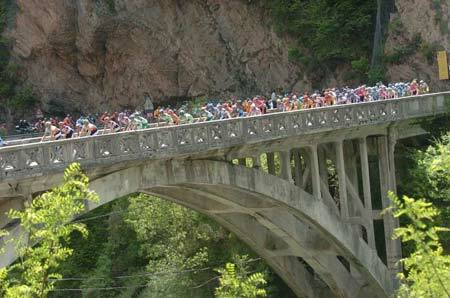 On the Tecla climb the big dogs started throwing high heat. 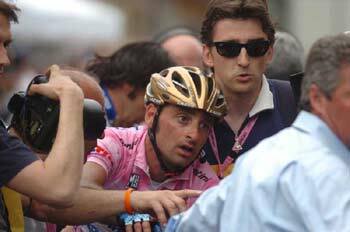 Bettini attacked and took Di Luca, Savoldelli, Simoni, Cunego among others. The sprinters are at the back, suffering. Km 174: Van Hout gets caught by the field. Only 8 kilometers into the race, Russel Van Hout (Colombia-Selle Italia) broke away. By km 46 he had about 17 minutes on the pack. Now, at km 154, he has about 4 minutes. 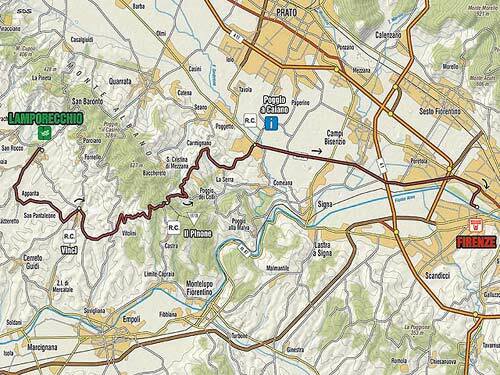 Stage 4, Wednesday, May 11: Giffoni Valle Piana - Frosinone, 211 km. Top: Cooke goes into the barrier. 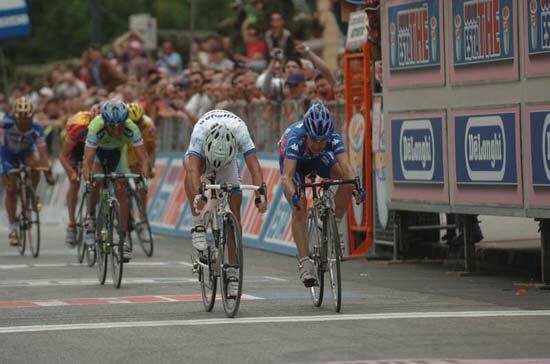 Middle: Bettini thinks he's got it as Cooke gets stoved in. Bottom: Bettini argues his case and loses. Fotoreporter Sirotti pictures. Dario David Cioni (Liquigas) s.t. 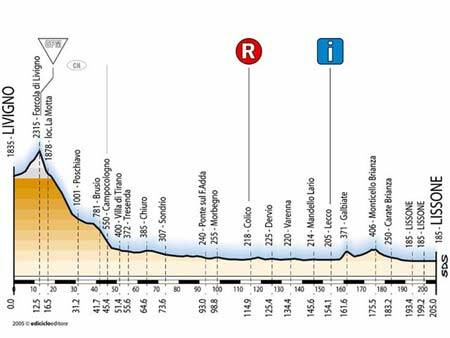 Stage 5, Thursday, May 12: Celano - L'Aquila, 223 km. Passo del Diavolo, 1,400 meters, category 2. Valico Monte Godi, 1564 meters, category 2. Goriano Sicoli, 742 meters, category 1. Above: Fassa's Bruseghin may have gone just a bit too early. Di Lucagets the stage win and the Pink Jersey. 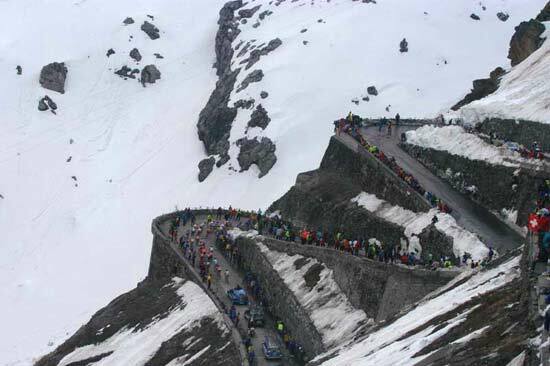 Below: I love these pictures of the racers descending switchbacks. Fotoreporter Sirotti pictures. Marzio Brusghin (Fassa Bortolo) s.t. Patrice Halgand (Credit Agricole) s.t. The finish. Di Luca takes the sprint, and with the time bonus, I assume, the Pink Jersey. Km 218, 5 to go. Rodriguez was caught with about 24 km to go. Bettini and 3 others were caught with with a little less than 20 to go. Liquigas and the CSC went to the front of the peloton and pushed it hard. Now the remaining 4 breakaways have been caught. It's all together. Km 183. 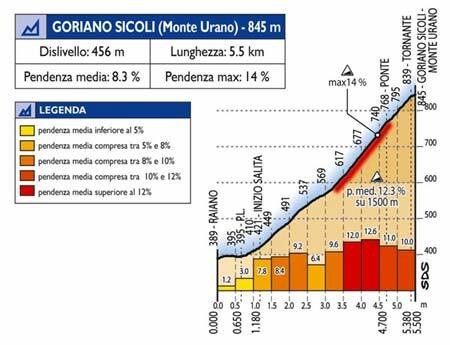 I expected the surging peloton to catch the breakaways on the Goriano Sicoli climb, but that didn't happen. 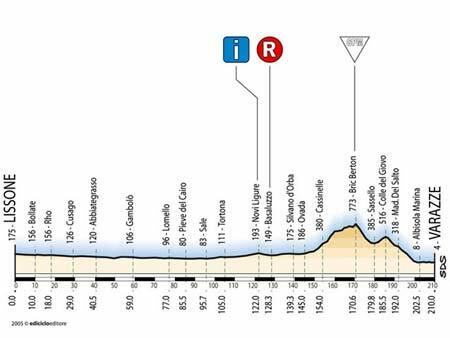 With about 40 kilometers to go Joaquin Rodriguez (Saunier Duval) is away alone, being chased at about a half minute by what's left of the 21-man break, now down to 8, but still including Bettini. The peloton is another 2 1/2 minutes back. 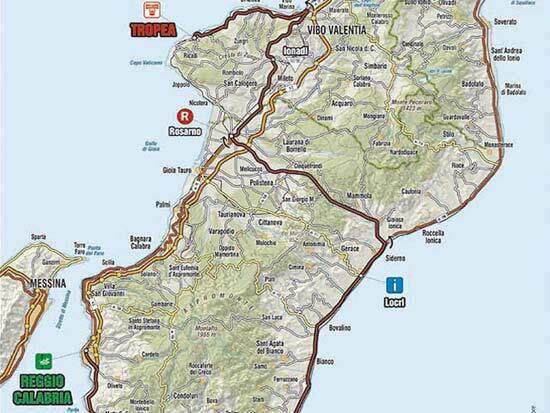 The real Giro contenders should show themselves on this stage. With an average gradient of 8.3% and a maximum of 14% things will really break up. 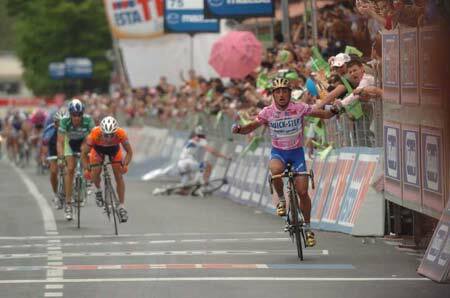 By winning the Intergiro sprint, Bettini gained 6 bonus seconds, enough to reclaim the Pink Jersey. 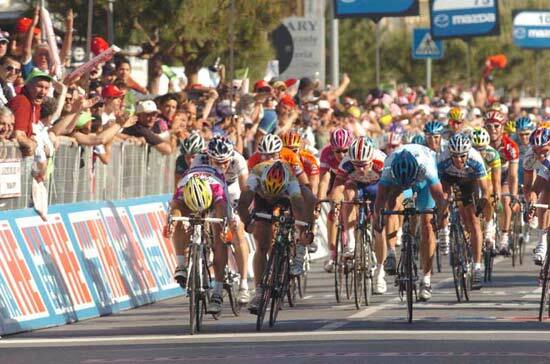 Alessandro Petacchi's leadout train came off the rails. In the finishing circuit in Grosseto they took a corner too wide and crashed. 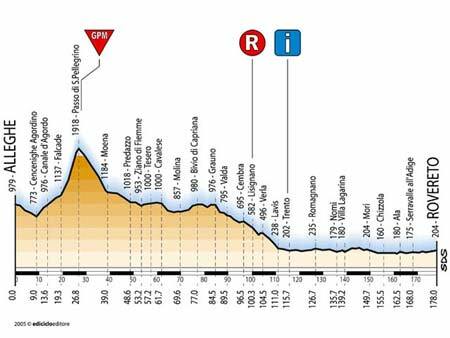 Petacchi is OK, but still no wins for Fassa in this Giro. Hey guys, be cool. I've got it under control. McEwen takes the sprint in stage six after his teammate Henk Vogels, who went early, died less than 50 meters from the line. 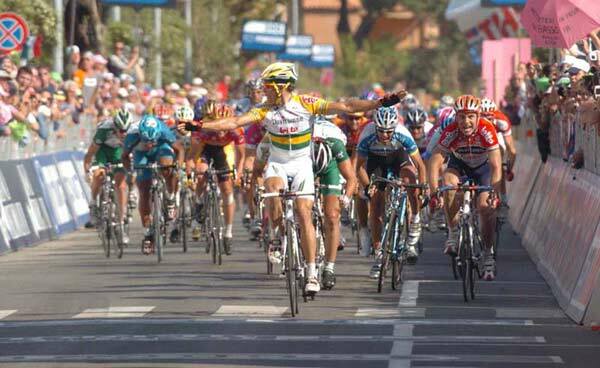 Robbie McEwen (Davitamon-Lotto) 3hr 37min 17sec. 42.248 km/hr. Isaac Galvez (Illes Balears) s.t. 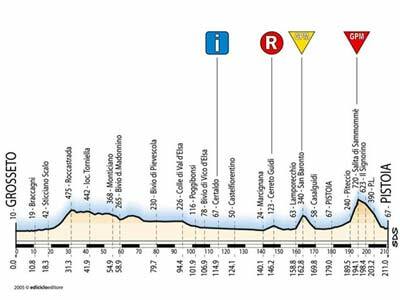 Stage 7, Saturday, May 14: Grosseto - Pistoia, 205 km. Top: Koldo Gil beats the other into town by almost a half minue. Bottom: No Damiano, you didn't win the stage. Mr.Gil is already having a soda and a rubdown. The rest of the race: Koldo Gil got away from the rest of his breakaway companions on the San Baronto climb. He made it stick. At the top of the Sammomme climb he still had a minute in hand. The rest of the 21 breakaways were caught. Behind Gil, with about a kilometer to go on the Sammome climb, Gilberto Simoni put the hammer down. All the important GC men went with him. About 500 meters from the crest Ivan Basso came off this group. 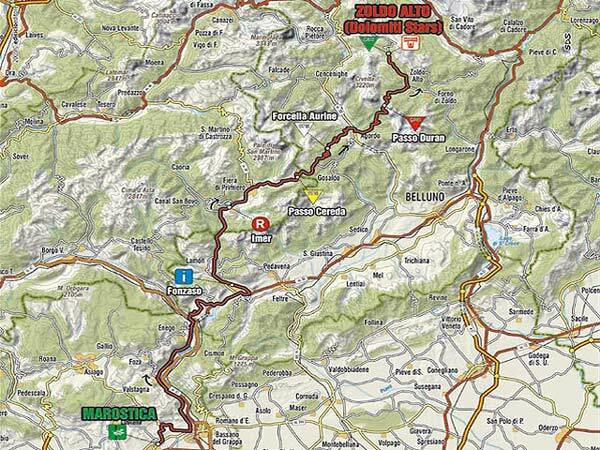 It seems that with each stage, this next great hope for stage racing loses little bits of time. That's how you lose a stage race. Tomorrow is a 45-kilometer individual time trial. 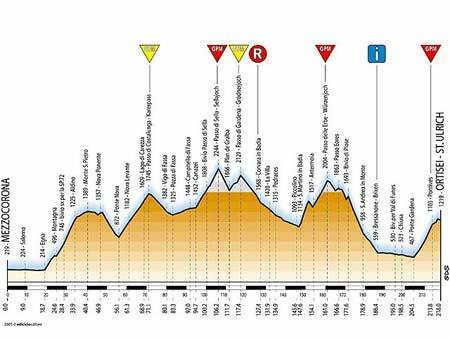 We're getting ever closer to Thursday's Stage 11 appointment with the high mountains. Km 140. The gap is now down to about 9 minutes. No more updates. I'll post the results around 10:30 PDT. Km 82. A break of 21 riders went away at about km 32. They now have a lead of 13 minutes. Quick Step is at the front of the pack, working ot defend Bettini's Pink Jersey. 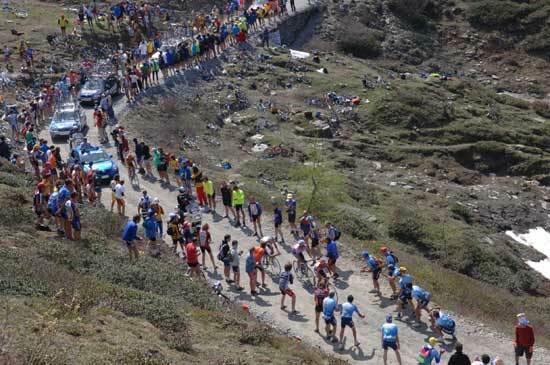 La Gazzetta dello Sport gives the names and backnumbers of the escapees as: E. PETROV (4), L. LEFEVRE (16), T. MARICHAL (35), I. PARRA (41), P. HALGAND (59), C. BRANDT (62), M. BARRY (72), M. CELESTINO (84), M. FERTONANI (85), S. CASAR (118), M. STRAUSS (128), CARRASCO GAMIZ (131) , D. BARANOWSKI (142), K. GIL PEREZ (145)C. WEGELIUS (159), S. ZAMPIERI (169), C. MORENI (176), T. ELTINK (182), A. GOMEZ GOMEZ (192), J. RODRIGUEZ OLIVER (196), M. KESSLER (212). Sprinter Ivan Quaranta has retired from the Giro. Top, Basso delivers. Bottom, Zabriskie has every reason to look pleased. Nice work! Fotoreporter Sirotti pictures. At last Petacchi and his Fassa Bortolo train get one! Fotoreporter Sirotti picture. Tom Danielson (Discovery), winner of this year's Tour de Georgia, retired after a few kilometers into today's stage. Knee pain has been troubling the rising star. Simone Cadamuro (Domina Vacanze) s.t. 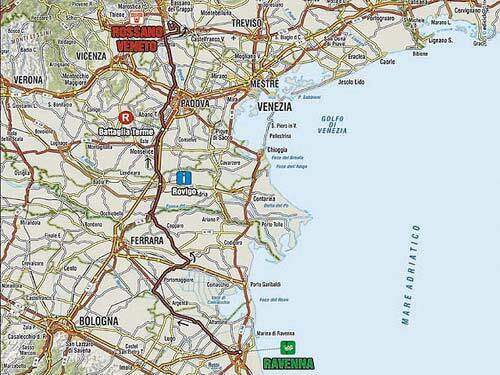 Stage 10, Wednesday, May 18: Ravenna-Rossano Veneto, 212 km. 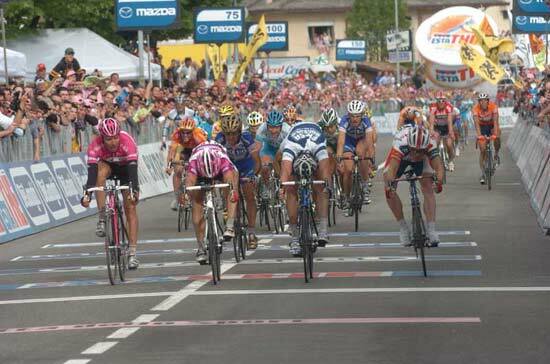 Another very close one: Lined up from left to right, Zabel, McEwen, Petacchi, O'Grady. Sirotti photo. 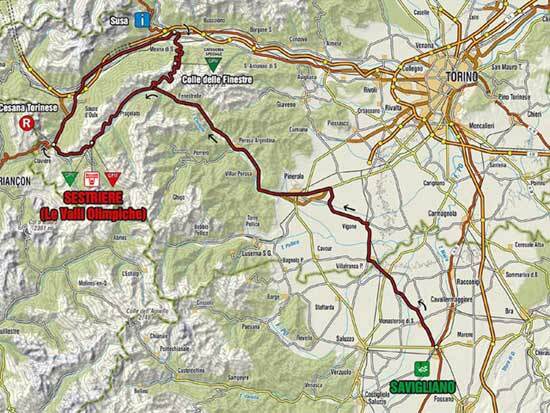 Stage 11, Thursday, May 19: Marostica-Zoldo Alto, 150 km. Passo di Cereda, 1369 meters. 7.6% average gradient, maximum of 16%. 649 meters of elevation gain. 8.5 km long. Passo Duran, 1601 meters. 7.6% average gradient, 14% maximum. 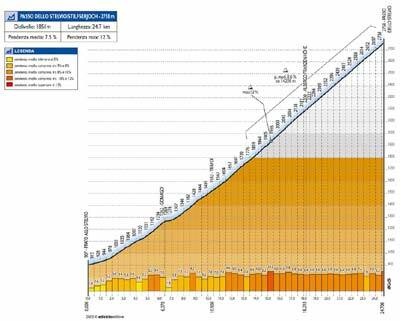 10 km of this climb has an average of 8.9%. 995 meters elevation gain, 13 km long. Zoldo Alto, 1520 m, hilltop finish. 6.9% average gradient with a maximum of 11%. 599 meters elevation gain. 8.7 km long. Top: The final five. From the left, Rujano, Savoldelli, Simoni, Di Luca, Basso. Middle: Savoldelli scoots by Basso for the stage win. Bottom: A nice place and a nice day for a bike ride in Italy. The sprinter's group came in at 32min 5sec. The finish. Basso keeps working, seemingly unconcerned about the stage win. Savoldelli outsprints Basso and wins the stage but Basso is the new Pink jersey. Simoni comes in about 20 seconds later. Di Luca a minute back. Km 149. Simoni is dropped. It's just Savoldelli and Basso with Basso driving hard. Di Luca is about 45 seconds back. Km 132. Over the top of the Duran, the elite 5 were together: Basso, Simoni, Savoldelli, Rujano (Colombia-Selle Italia) and Di Luca. Di Luca was seeing stars getting back up to the front group. Near the top of the Duran. Now it's just Basso and Savoldelli. Di Luca is back about 20 seconds getting back up to Savoldelli and Rujano who are now about 15 seconds behind Simoni and. Basso. Cunego is about 2 minutes back. Km 128. Now Basso has gone to the front and set a very hot pace. Only Simoni, Di Luca and Savoldelli can stay with him. Cunego is toast, a minute back. Km 120. On the Passo Duran. Halgand has been caught. Simoni has attacked, as expected. Basso and Di Luca have responded. 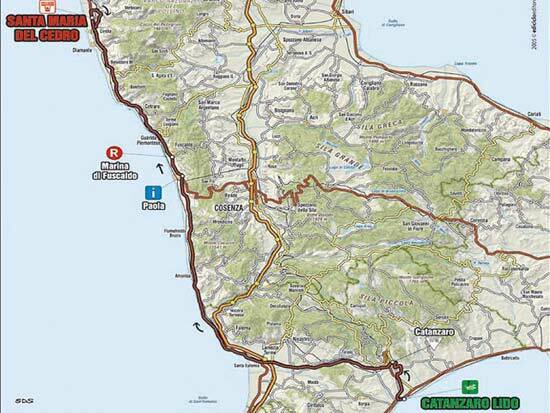 Cunego and Garzelli are in trouble, about 10 seocnds back. The pack is being shredded. Cunego has clawed his way back up to the front group. It looks like about 20 riders have formed an elite selection at the front. Savoldelli is in the front group. And Cunego is off the front group. Km 114. In the valley before the start of the Passo Duran climb. Patrice Halgand is away alone with a 38sec advantage. Lampre has been policing the field. The big guns are still in the pack. Pink Jersey Di Luca has been sitting about five riders back. No mistakes this time. 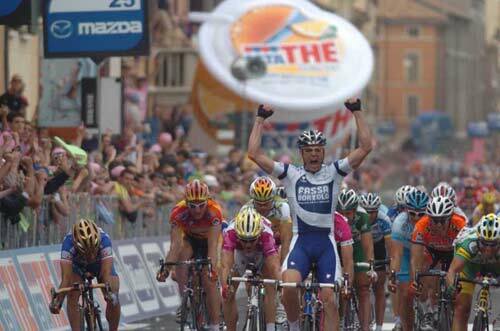 The Fassa train brought Petacchi to the front and he delivered. Sirotti photo. Passo Gardena, 2,121meters. 260 meters elevation gain. 5.8 km long. 4.5 % average gradient, 10% maximum. Passo delle Erbe, 2004 meters. 1070 meters elevation gain.15.2 km long. 8.7% average gradient. 16% maximum. This comes early in the climb. 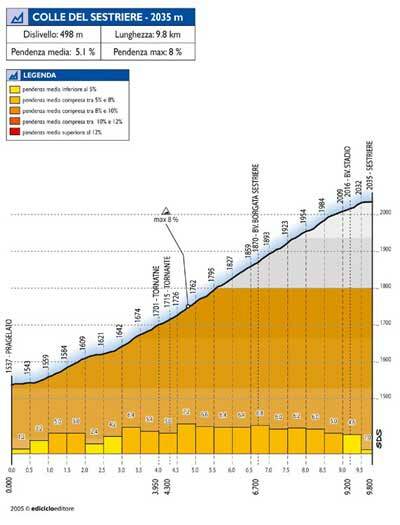 The second half of the climb, after a short descent, averages 9.4%. Pontives, 1,103 meters. 635 meters elevation gain. 9.3 km long. 6.8% average gradient, 12% maximum. This come on the way up to the finsh line at Ortisei. 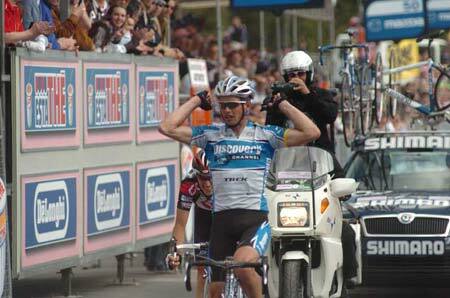 Ivan Parra wins on of the Giro's toughest stages, solo, after being away for over 180 kilometers. 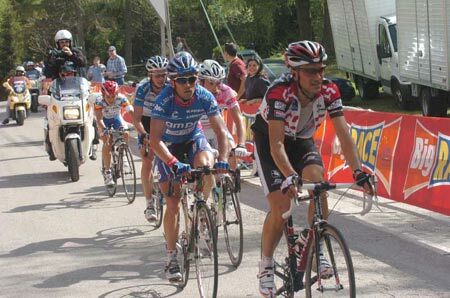 That's Jose Rujano in the Giro Climbing Leader's Green Jersey and Vittoria Shoes tucked in with Ivan Parra. 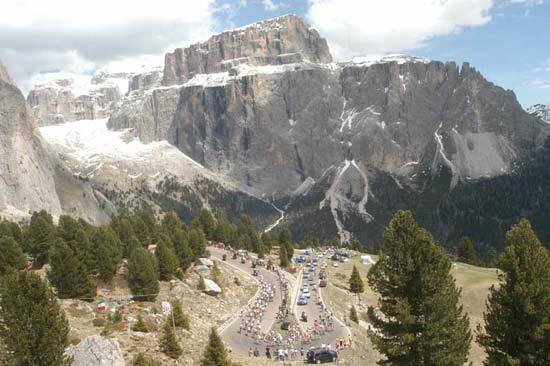 Today's stage went around a massive limestone massif called the "Gruppo Sella". As you can see from this small piece of it, it is one of the most spectacular sights in the world. José Rujano (Selle Italia) s.t. Danilo Di Luca (Laiquigas) s.t. 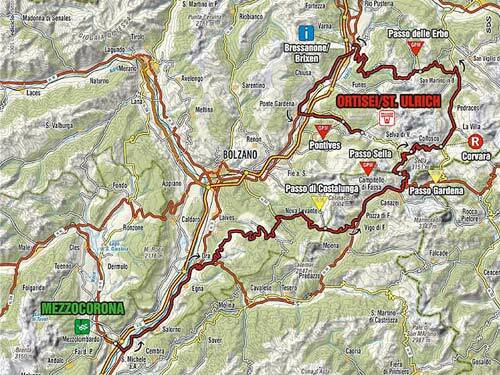 On the final climb to Ortisei: Parra attacked his breakways and just flew up the hill. 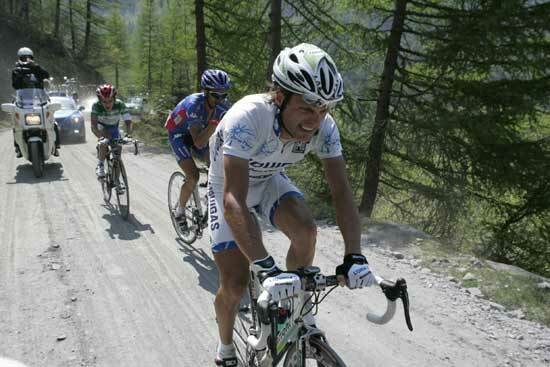 In the Basso group, Basso was clearly having trouble, riding at the back of his group. Simoni attacked and Basso was dropped. Savoldelli was able to go with Simoni. Savoldelli applied some heat of his own and Simoni was dropped. Di Luca got up to Simoni but Savoldelli was gone and that's about how they came in. The first 8 finishers were those who were was left of the big break. Km 205. Basso's growing group starts the climb about three and a half minutes behind the break. Km 160. Simoni and Cunego attack on the Erbe climb. Basso did not react but let his teammates slowly bring him back. The now greatly reduced Pink Jersey group with Simoni and Cunego went over the top of the Erbe about 5 minutes behind the break, which was now down to about 12 riders. Km 140: Before the Passo delle Erbe. The 19 breakaways still have seven and a half minutes on the pack. Km 80. The riders are abandoning all over the place. 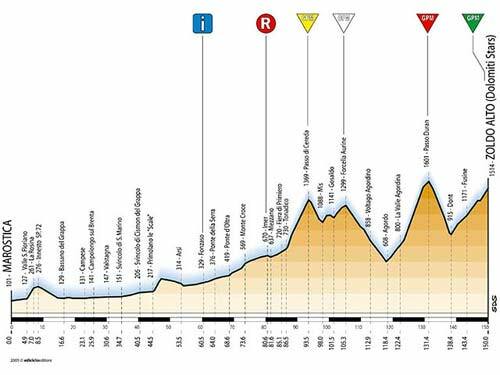 Before the Passo Sella here are the guys who have decided to watch the finsh on TV: L. Bertagnolli, Steven De Jongh, T. Ziegler, M. Fertonani , Ryder Hesjedal, Thorwald Veneberg, D. Navas-Chica, Joseba Beloki. There's a group of about 20 off the front. The highest placed looks to be Juan Manuel Garate, who's about 7 minutes down on the GC. 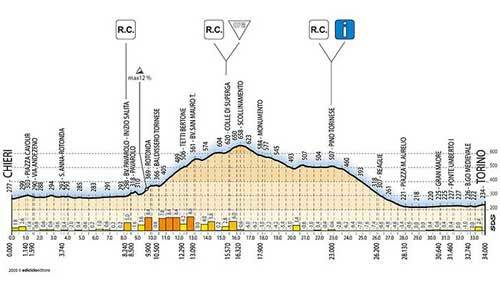 At the start of today's stage: Only 177 riders started. 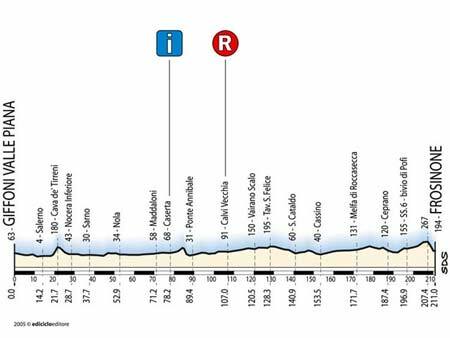 The following riders didn't show up to race today: Stefano GARZELLI (2000 Giro winner), Robbie MCEWEN, Stuart O'GRADY, Jaan KIRSIPUU, Aart VIERHOUTEN, Baden COOKE. McEwen had made it known for days that he didn't want to overcook himself in the Giro and would withdraw before the mountains. 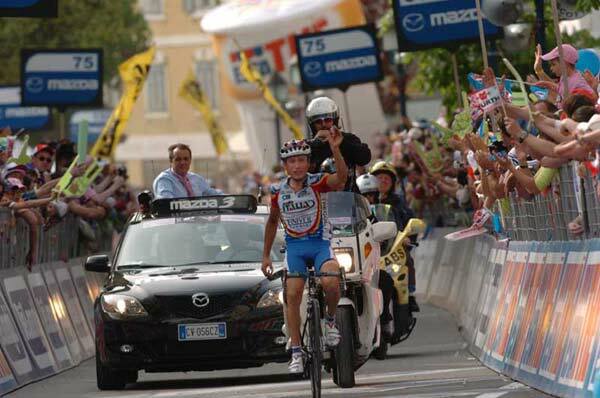 Two monster Giro stages in a row for Ivan Parra! The Stelvio pass, covered in snow. Both photos by Sirotti. 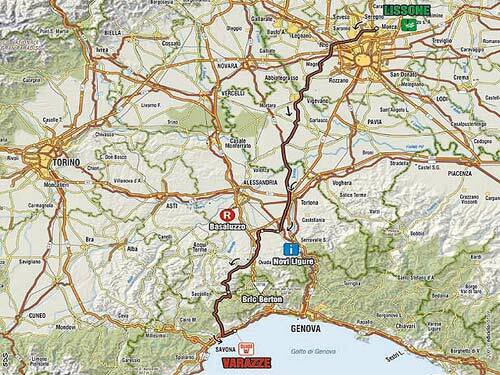 Results: Basso's stomach problems continued as the former Pink Jersey holder lost over 40 minutes. Jose Rujano (Colombia-Selle Italia) s.t. Juan Manuel Garate (Saunier Duval) s.t. 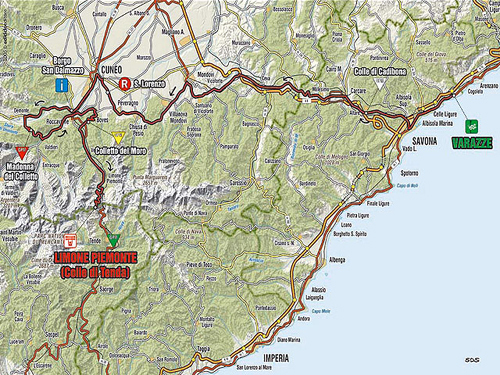 In 2002 I rode several of the climbs in Saturday's and Sunday's stages. 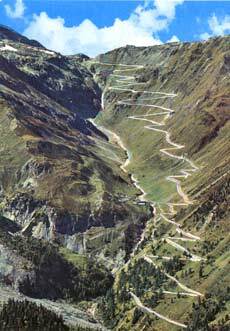 Pictures, history of the Stelvio and diary. 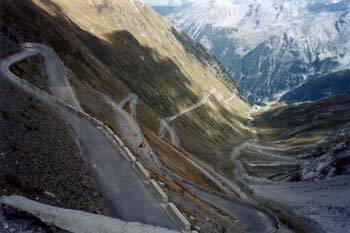 Here are two views of some of the Stelvio and its 48 switchbacks. 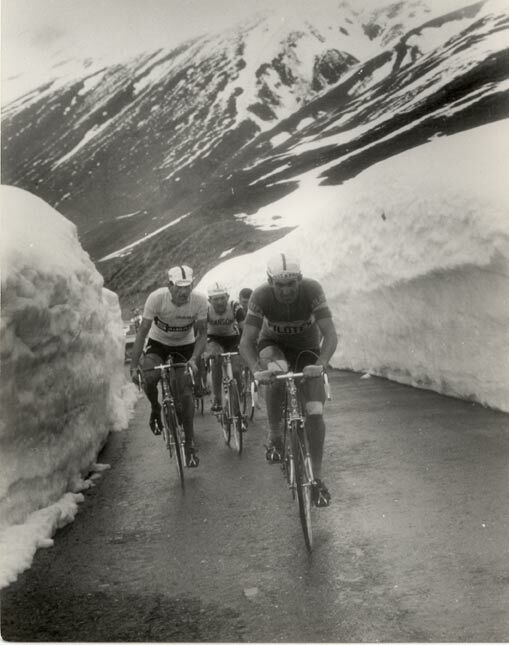 The great Franco Bitossi leads Vittorio Adorni up the south face of the Stelvio in the 1965 Giro. Elevation detail of the Stelvio. There is no place to rest. Once the climb proper begns at Gomagoi it never flattens. 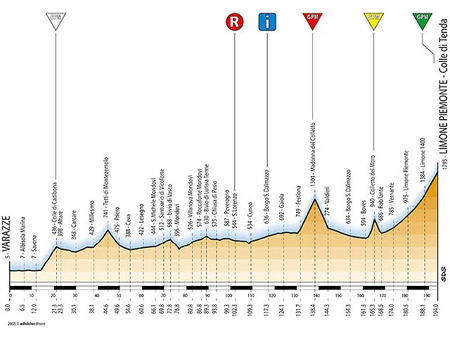 Stage 15, Monday, May 23: Livigno - Lissone, 205 km. 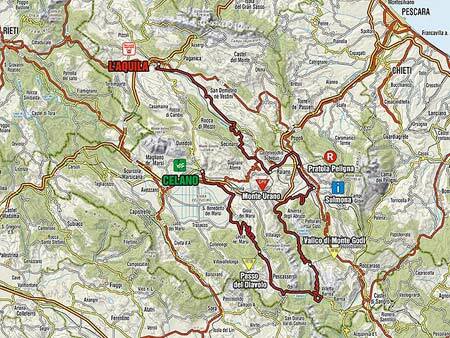 Bad weather on the Forcola di Livigno forced the Giro organizers to shorten the stage by 50 kilometers. 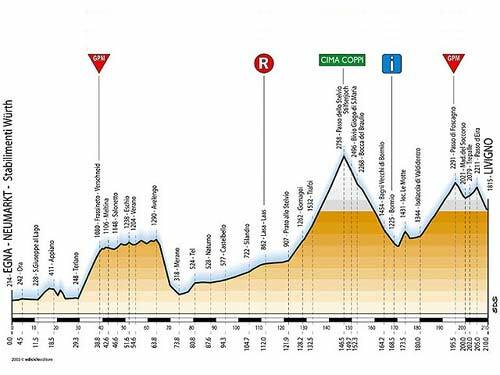 The riders drove to the far side of the day's only climb and started in Villa di Tirano at the bottom of the climb. 159 riders started. Michael Rasmussen quit. Zabel comes close, but Petacchi wins one on wet streets. Note the arm warmers and knickers on the other riders. Bric Berton, 773 meters. This climb averages a little over 3%, but it has a spot of 12% gradient. A late attack paid handsomely for Le Mevel. Results: A break got away from a rather disinterested peloton. Addy Engels (Quick Step) s.t. Pack came in at 22min 46sec. 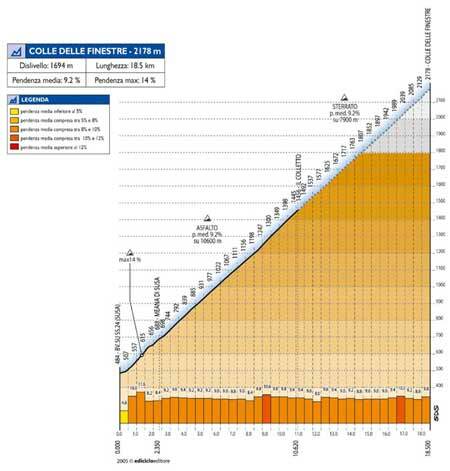 Limone Piemonte- Colle di Tenda, 1795 meters, hilltop finish. 822 meters elevation gain. 13.5 km long. 6.1% average gradient with a maximum of 11%. Redemption for Basso! Fotoreporter Sirotti photo. Vladimir Karpets (Illes Balears) s.t. 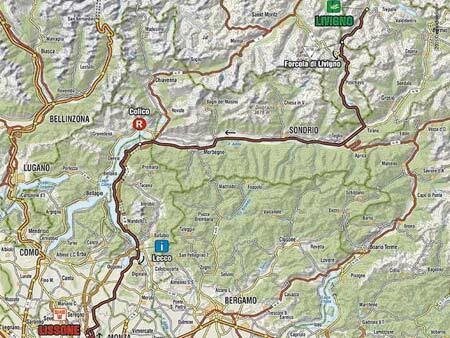 At the 15.7 km check point Savoldelli is 14 seconds ahead of Simoni. Savoldelli went through the 8.7 km time check only 5 seconds faster than Simoni. He's going to need some time in hand for tomorrow's savage day in the mountains. 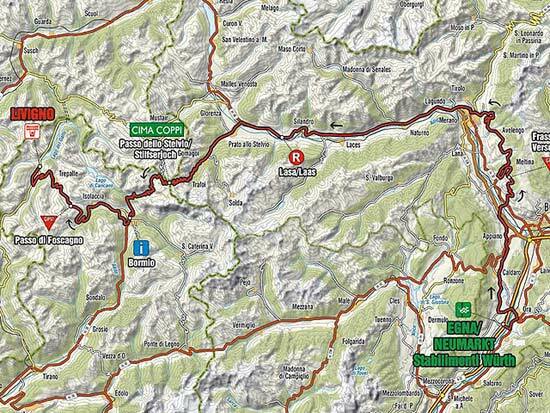 At the second time check point (15.7 km), Ivan Basso is 30 seocnds ahead of Zabriskie. 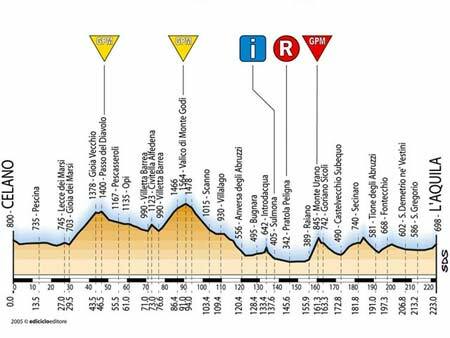 There are 158 riders left in the Giro. 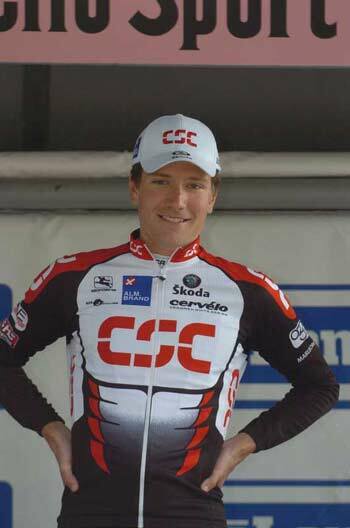 With 90 riders in the barn, CSC's David Zabriskie, who won the stage 8 time-trial, has again scorched the course. He's currently leading with 44min 25sec or 44.917 km/hr. The current second place is Rabobank's Thomas Dekker, down 1min 34sec. It will be a while before the big guns at the top of the GC are finished. 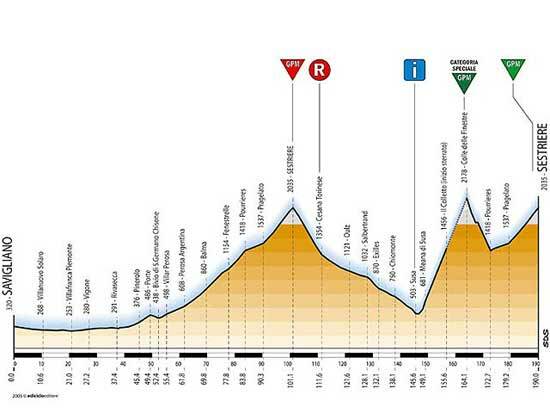 Stage 19, Saturday, May 28: Savigliano - Sestriere, 190 km. The final 8 kilometers of the Finestre climb is a dirt road. On the dirt section of the Finestre, Savoldelli (in pink) chasing. All photos by Sirotti. 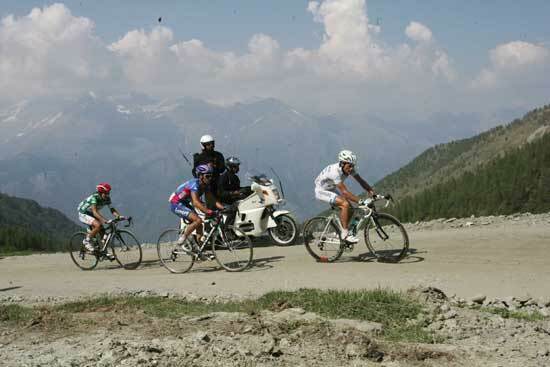 Rujano, Simoni and Di Luca on the Finestre before Di Luca cracked. Stage winner and Green Jersey holder Jose Rujano. Rujano, Simoni and Di Luca on the Finestre. The finish. Rujano crosses the line first. Simoni is second at 22 sec. Di Luca is third at about a minute and a half. Savoldelli comes in at 1min 55sec. He's still in pink. 2 km to go. Rujano is 20 seconds ahead of Simoni. 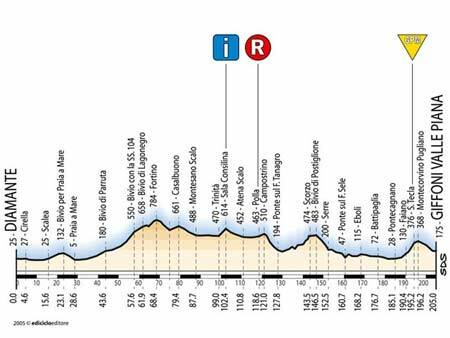 Savoldelli is about 1 min 35sec behind Rujano, so unless something amazing happens in the next few minutes, Savoldelli should win the Giro. 4 to go. Rujano drops Simoni. 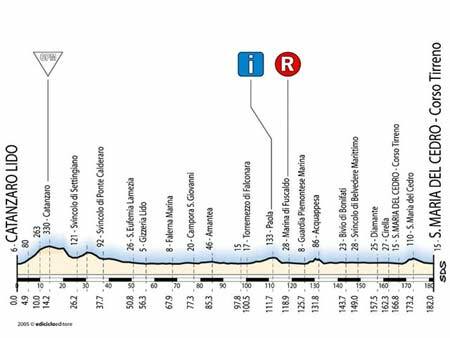 There goes the 20 second bonus and probably the Giro for Simoni. 8 to go. The gap is 1min 23sec. Simoni will need to do more than that to get the Pink. Di Luca is back 25 seconds. 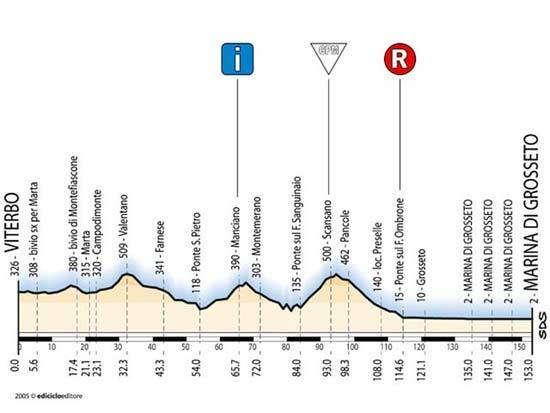 Assuming Savoldelli is denied the third place time bonus because Di Luca satys between Rujano/Simoni and Savoldelli, Simoni needs to come in 1min 50 sec ahead of Savoldelli. Km 180, 10 to go. We're on the second time up to Sestriere. The gap is only 1min 37sec!! 14 km to go. Di Luca has been dropped by Simoni and Rujano. The gap back to Savoldelli is just a touch over 2 minutes. Rujano had not been working before and now he is. Looking at yesterday's time trial (14th place, 4 seconds slower than Di Luca), Rujano should be able to really contribute. 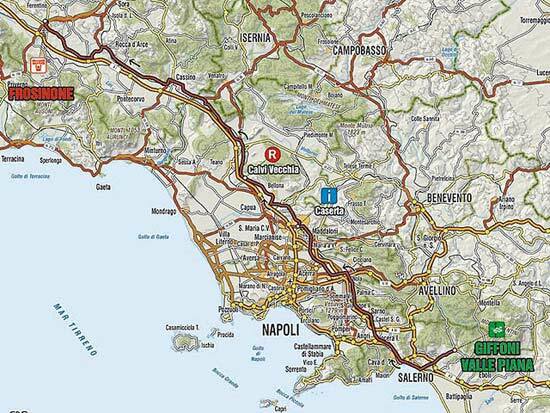 The Giro is going to come down to these few kilometers. And remember, the stage winner gets a 20-second bonus. Second place is 12 seconds and third is 8 seconds. Less than 20 km to go. Savoldelli has pulled back a little time on the descent. He's about 2min 5sec back. Over the top... Di Luca, who did most of the work on the climb, led Simoni and Rujano. Savoldelli accompanied by Atienza and Ardila followed at 2min 19sec. I am sure Savoldelli is going to just fly down the mountain. This will be something. Don't write off Simoni, He is a superb descender. Near the Finestre summit. Savoldelli has stabilized things a bit. The gap is 2min 8sec. Km 166: Now Ivanov has been caught and dropped by Simoni, Di Luca and rujano. Savoldelli is 2 minutes back. Nope, now is 2min 12sec. Simoni is the virtual Pink Jersey. Km 165. 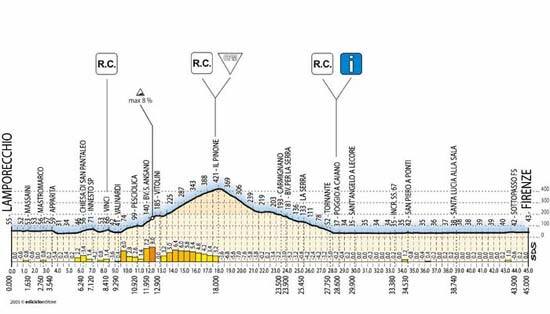 Up front it's down to Simoni, Di Luca and Rujano. The Savoldelli group is 1min 10sec behind. The gap has now grown to 1min 40 sec. Simoni is 2min 9sec behind Savoldelli in the General Classification so he's close to the gap he needs. Km 163: Simoni has Di Luca, Honchar, Atienza and Rujano with him. 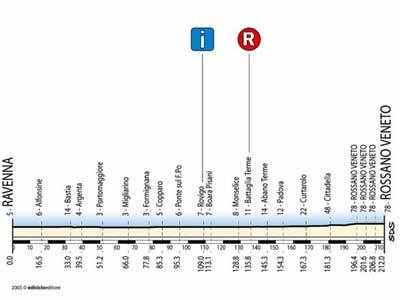 They are already about a minute ahead of the Savoldelli group. 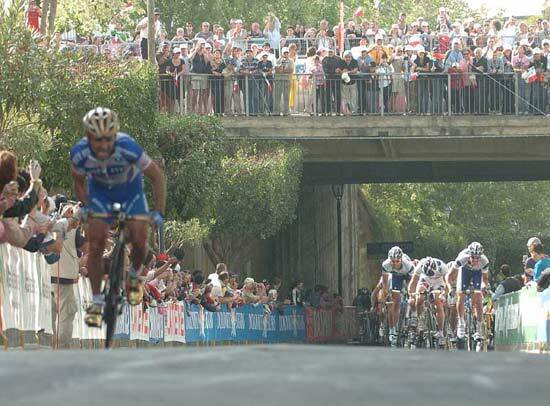 Basso was dropped by the front group and then by the Savoldelli group. Savoldelli has only Ardila and Wladimir Belli with him. He's got to do this himself. Belli is a teammate of Honchar up the road. The Simoni group is now on the dirt section of the pass. Km 162. BAM! Colombia-Selle Italia rider Illiano dropped the hammer. Gaps opened up immediately and Savoldelli either didn't or couldn't react. Simoni, Basso, Di Luca and Cunego did go with him. 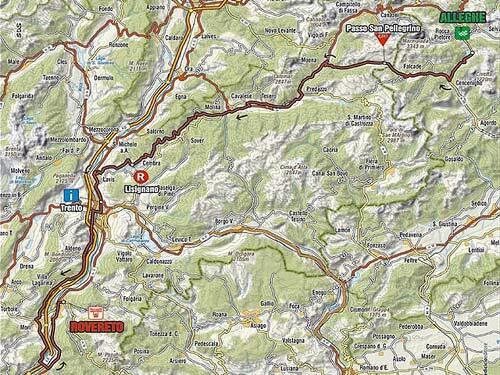 Km 149: Ivanov and Niermann have gone through Susa, which is at the bottom of the Finestre climb. Renshaw has been caught by the peloton, which is now 8 1/2 minutes behind the break. At the front of the peloton, CSC, Colombia-Selle Italia and Lampre have been working today. That should give a clear idea of who has ambitions. Savoldelli announced that his plan was to ride defensively and avoid time loss. Now Ivanov has dropped Niermann. Km 135. Everyone is on the long descent to the base of the Finistre climb. 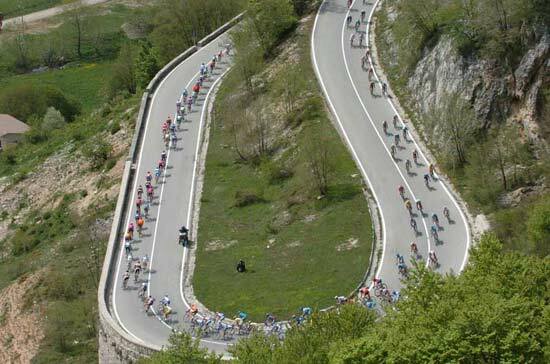 A Category 1 climb in the Giro is usually the same as an "Hors Category" climb in the Tour de France. 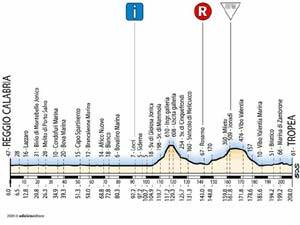 But for the Finestre, The Giro organizers have given it a "Categoria Speciale" rating. 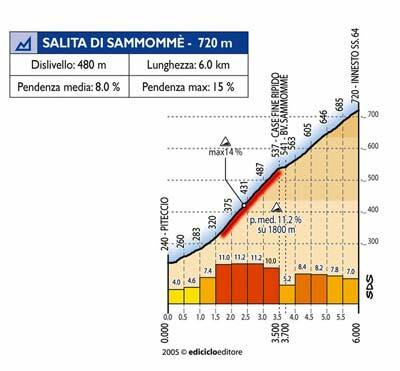 While there has been a lot of focus on Savoldelli's amazing descending abilities, Simoni is also a very fine descender. 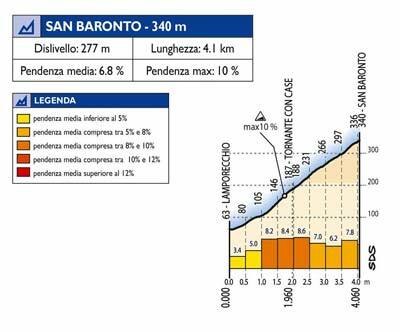 If he gets away from Savoldelli on the climb, he may just be able to hold the lead on the way down. Maybe. The breakaway duo is about 12 minutes ahead of the pack with Renshaw about smack in the middle. Km 105: Ivanov led Niermann over the top of the Sestriere climb. Renshaw is about 6 minutes back and the pack is a bit more than 14 minutes beind the leading duo. Km 83. 154 riders started today. 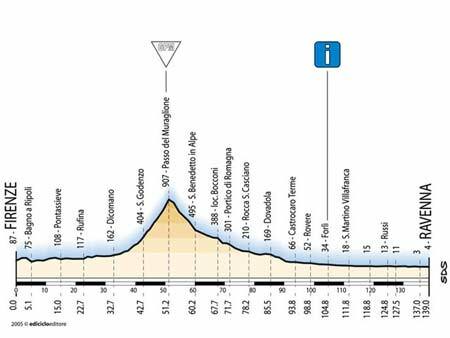 On the lower slopes to Sestriere: Mark Renshaw, Grischa Niermann and Ruslan Ivanov broke away in the first 15 minutes of the stage. Now Renshaw is between the pack and his former breakways. The break is about 16min ahead of the pack with Renshaw 1 min 30sec behind the leaders. 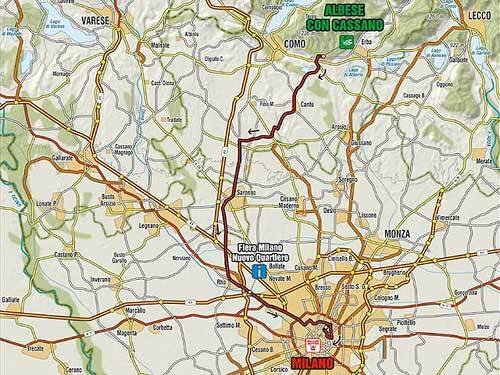 Stage 20, Sunday, May 29: Albese con Cassano - Milano, 119 km. 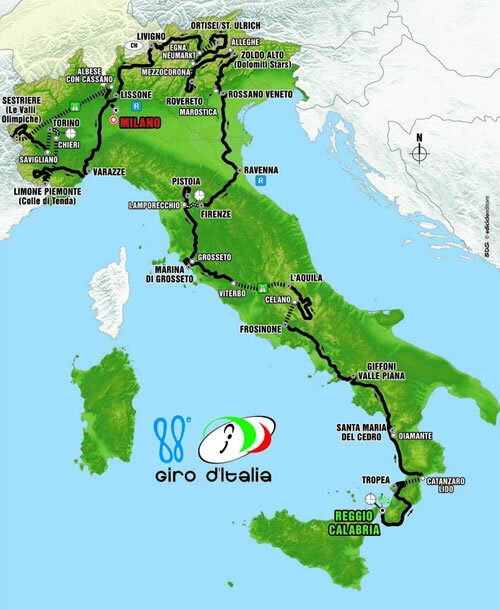 The Giro's final stage includes 12 circuits in downtown Milan. 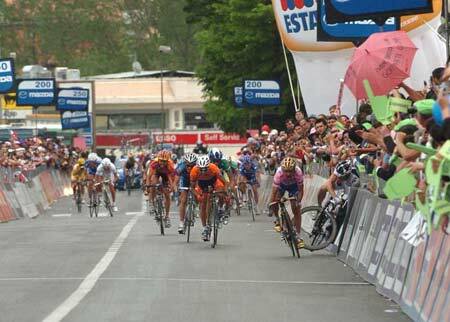 That makes 4 stage wins for Petacchi in this Giro. And as Porky Pig says, "a-blee, a-blee, That's all folks." Sirotti photo. 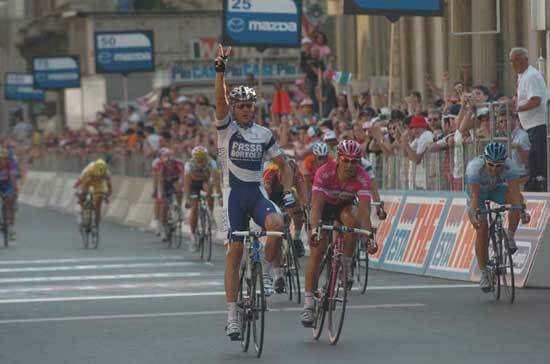 Alessandro Petacchi (Fassa Bortolo) 3hr 24min 8sec. 35.329 km/hr. Mirko Lorenzetto (Domina Vacanze) s.t. Paolo Bettini (Quick Step). I believe that for Bettini to keep his purple points jersey, he had to do no worse than 13th if Petacchi won the stage. Official Giro list of entrants. 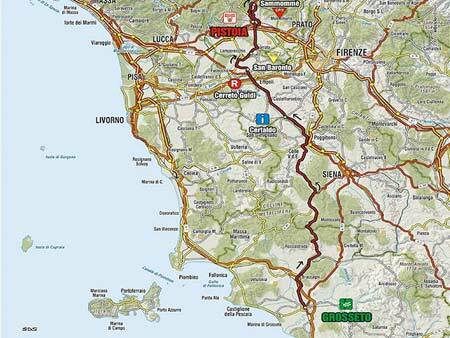 Our fearless panel of experts have started to send us their predictions for the Giro. Thanks to Valeria Paoletti for her help. General Classification: 1. Gilberto Simoni, 2. Damiano Cunego, 3. Ivan Basso. Climber: A Spaniard or Colombian, to difficult to tell.